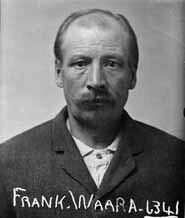 Allegations: When found by conductor and brakeman in empty boxcar on Chicago, Milwaukee & St. Paul train between Three Forks and Harlowton on 4/21/18, said "Americans are no good, and I hope that Germany will win." Case Details: Convicted in jury trial. Jury out 20 minutes. Counsel H.S. Farris. Served 11 months in Deer Lodge. Released May 11, 1919. Personal Information: Born in Sweden near Finnish border. Arrived in Ellis Island June 24, 1904, with $12 aboard S.S. Lucania from Liverpool. Preceded by three older half-siblings who lived in Michigan. Lived with uncle, cousins and brother in Astoria, Ore. before coming to Montana. Worked as a laborer. Date and location of death unknown. Living relative in Oakland, Calif.